Is the idea of a sedan outdated? Consumers are leaving sedans in droves for crossovers. But carmakers aren’t ready to give up just yet. We’ve tested several new luxury sedans in the past few years, none of them quite so highly anticipated as this. The Cadillac CT6 is the brand’s largest sedan in a long time, but don’t even think of comparing new Cadillac to the Cadillac of old. Modern Cadillac doesn’t do luxury without drivability. That’s a tough task when your new sedan has a wheelbase four inches longer than the Escalade. The CT6 in constructed on an all-new platform. Through the use of new materials, adhesives, and construction techniques, our CT6 tester only weights 17 more pounds than a smaller CTS of the same configuration. That configuration would be the RWD 2.0L Turbo Luxury CT6. It’s an odd choice for the middle of winter, but this particular CT6 show’s off the model’s best features. The Enhanced Vision and Comfort Package, Rear Seat Infotainment Package, Bose Panaray sound system, and 19 inch wheels rack up $11,000 in options, making this the most well-equipped four-cylinder, rear drive CT6 available. The new CT6 is 100% Cadillac. The limo-like length, glimmering chrome and LED accents, and soft-but-angular design give the CT6 an understated appearance – almost too understated for our liking. 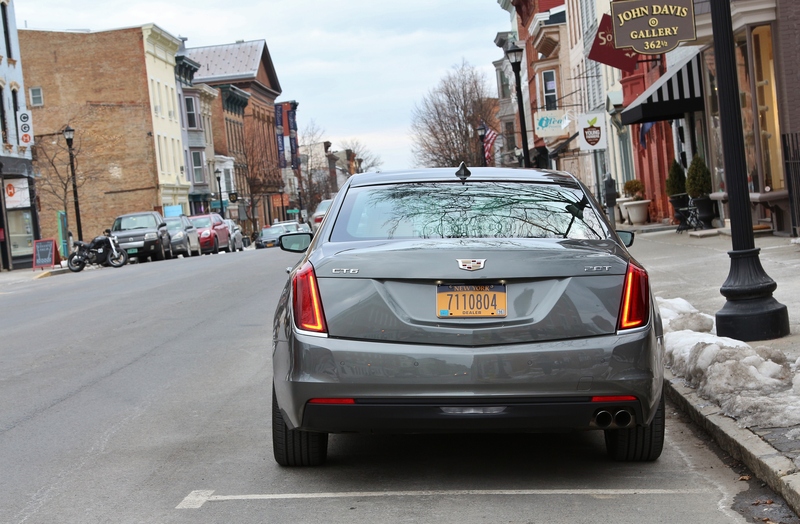 Perhaps it’s the Moonstone Metallic color instead of a deep black, bright white, or splash of color, but our CT6 just didn’t stand out on the road like you’d expect for a big Cadillac. It is a classy and sophisticated sedan, however. Eagle-eyed fans will notice monochromatic Cadillac badges adorning both quarter panels of the CT6. Don’t be surprised to see the monochromatic badge proliferate on new Cadillac models. The cabin is packed with technology. CUE is back and in its best form yet, other than the annoying touch-pad. Thankfully, the crisp touchscreen renders it unnecessary. The optional rear camera mirror is perhaps the most innovative and successful automotive advancement in the last 5 years. On the road, the uninhibited, wide-angle view of the road behind is unlike anything you’ve ever experienced. Only dried salty road spray on the lens at night seemed to have an impact on the fidelity. It’s only limitation comes when reversing into a space. The camera’s perspective, from the trunk, is alarming at first glance. Thankfully, the camera mirror can be reverted to a traditional mirror and is supplemented with a traditional backup camera. Unlike our CT6’s gray exterior, the cinnamon interior with carbon fiber trim is a breath of fresh air. We might not be crazy about its pairing with the Moonstone, but it’s refreshing to see some color inside a big car. It’s the same approach that helped us fall in love with the Escalade and Volvo XC90. The seats are beautifully upholstered and the interior fitments are high quality. 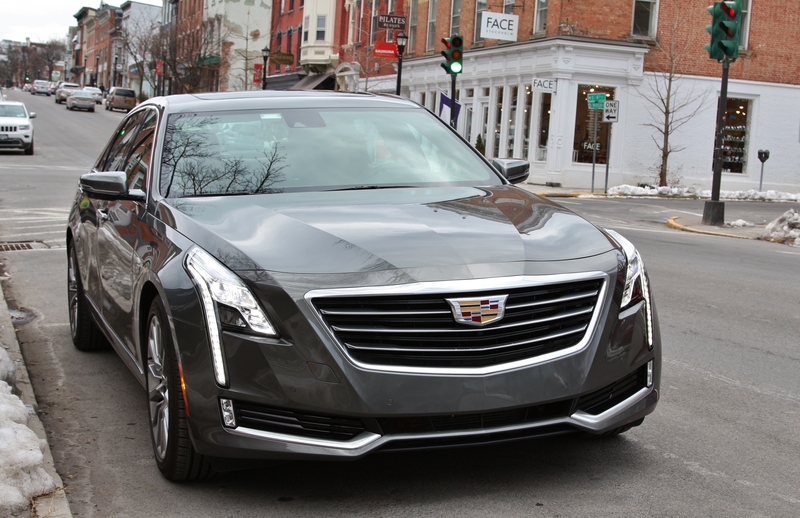 The CT6 is let down, however, by its flat seats that don’t have the range of adjustability consumers have come to expect from a $70,000 luxury car. 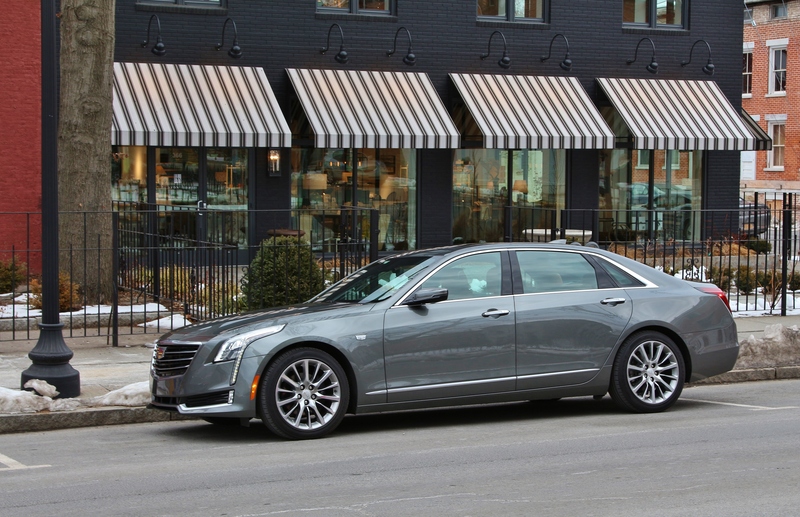 One luxury car feature where the CT6 excels is its top-tier sound system. The Bose Panaray system features a can’t-find-them-all 34 speakers. The system also brings a new suite of software to makes your low-fidelity audio sources sound better than anywhere else. It does a phenomenal job. Cadillac’s design and interior appointments put it solidly in luxury-car territory. But the CT6’s driving experience makes it a new Cadillac. Behind the wheel, you simply can’t tell that you’re piloting a vehicle with a 10-foot wheelbase. Traditional suspension doesn’t work the magic of Magnetic Ride Control, but it does a solid job of controlling body motion. In fact, the CT6 is a few notches on the hard size for a luxury sedan. But that setup, combined with the good steering and great brakes, let you drive the CT6 in a way you wouldn’t normally drive a luxury sedan. Hustling though the mountains, it’s possible to induce motion sickness in your passengers. Passengers might beg for respite, but the 2.0L certainly won’t. We were skeptical that the 265hp and 295hp would be sufficient propulsion. A 335hp V6 and 400hp twin-turbo V6 are available and fall more in line with offerings from other competitors of this caliber. But the plucky turbocharged four-pot provides adequate power and a smoothness befitting its purpose. Only the aggressive and unrefined stop-start spoiled the party. 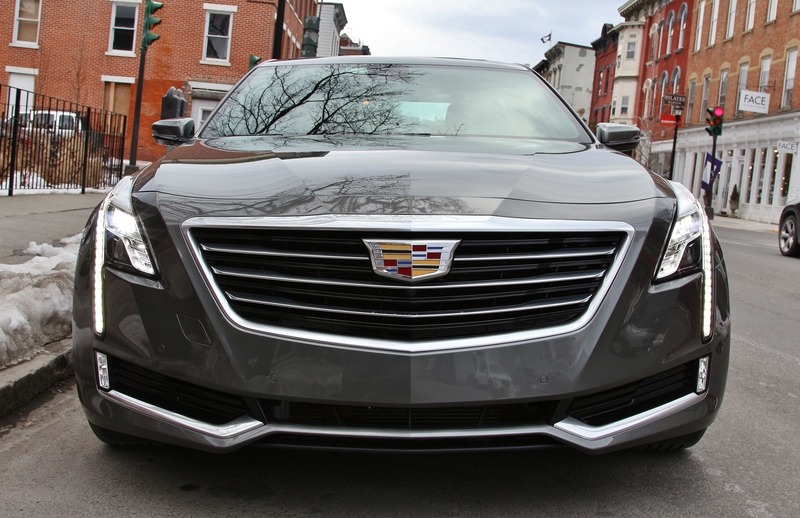 The sedan isn’t outdated and leave it to Cadillac to prove it. 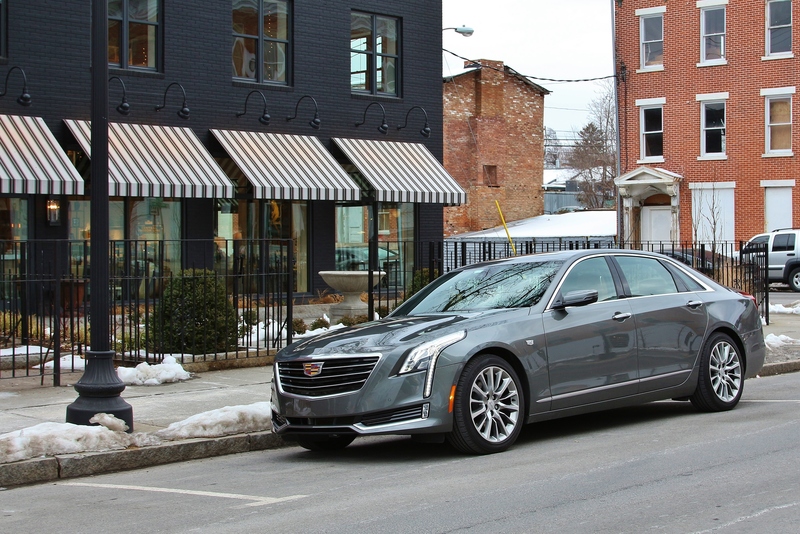 The new CT6 offers premium appointments, groundbreaking technology, and a driving character that will frighten anyone who rolls their eyes when they hear about the “big new sedan” from Cadillac. Imagine their shock as they discover this “big” Cadillac breaks all its stereotypes. Lightweight, agile, and diminutive displacement, this is the least “Cadillac” a full-size Cadillac sedan has ever been. But that’s the new Cadillac for you.